Impending Distractions: How cool is this? 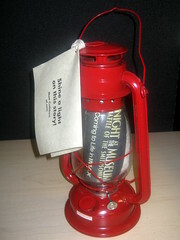 This lantern was dropped off for me at work yesterday while I was in a meeting. It's a marketing promomotion for Night at the Museum: Battle of the Smithsonian at the McWane Science Center's IMAX theater. I must say that Chandler Harris and her team at McWane put together some of the coolest promo kits I've ever seen. Check out this one from Dinosaurs in Alabama, and this one from Itty Bitty Magic City. And let's not forget my favorite promo kit ever -- the one for Harry Potter and the Order of the Phoenix. I wasn't the least bit excited about the Night at the Museum sequel, but all of sudden they've got my attention. Just brilliant.